If you’re like most guys, on average you’ll spend months of your life shaving. So it’s no surprise that when you reach for something to tame your beard, you’ll want it to be easy to use, convenient and up to the job. Each type of razor, shaver or trimmer has its pros and cons, which we’ve laid out for you here. In the end, though, it all comes down to what works best for your beard. Disposable razors usually come in multi-packs and are the cheapest of all razors. Be warned, though, quality varies quite a bit. The cheapest ones may leave your face nicked and bleeding. Higher-end disposables, though, can give you a shave that rivals cartridge shaving systems. There is also the downside of tossing out a whole razor every time you’re done with it, which is not the most environmentally friendly way to shave. A straight razor is the way to go if you want to shave the way your great-grandfather did. After shaving with a sharp blade, your face will be as smooth as a baby’s skin. 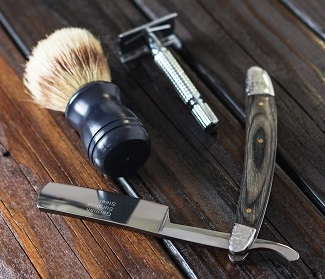 You’ll pay more up front for a straight razor and the accessories needed to keep it sharp — known as a hone and a strop. But unless you lose your blade, you won’t need to buy another one for the rest of your life. There is also a bit of a learning curve, but once you have mastered shaving with a straight razor you might even find it to be meditative. Cartridge razors give you the convenience of replacing your blade whenever it is dull, without having to throw out the entire razor. Most cartridge razor systems come with a handle that is heavier than disposables, which can make it easier to maintain control while shaving. These razors are more expensive than disposables. You’ll also pay more for brands with more blades and lubricating strips. Good systems, though, will give you a smooth shave without having to cover your face in band-aids afterwards. Look for ones with a swivel or pivoting shaving head. If you’re wondering whether multi-blades means better results, you are probably right. Cartridges with three or more blades will usually give you a closer shave, with fewer nicks and razor burn, than razors with one or two blades. And if you want an even better shaving experience, try ones with lubricating strips to soothe your skin as you shave. Double-edged razors are another blast from the past, but their exceptional shaving performance continue to earn them many shaving converts. Also known as “safety razors,” these allow you to shave with a razor blade without nicking your face to pieces. Razor handles — if you can find them — won’t set you back very much money and the blades are super cheap. When your blade is dull, just toss it out and start fresh with a new one. Electric shavers can’t be beat when it comes to convenience and low-mess shaving. Models vary in terms of the number of shaving heads and other features like sensors to detect the thickness of your beard, sonic vibration and cooling heads. The biggest advantage of a good electric shaver is that you’ll be less likely to walk out of the bathroom with a face covered in nicks and razor burn. The downside? You’ll pay more up front and still have to replace your shaving heads every six to 12 months. Basic models are moderately priced, but electric shavers with all the features can be very expensive. Beard trimmers are not just for grooming your full beard. You can also use them to maintain that stubble look, as if you hadn’t shaved in a few days. Some electric shavers come with a trimmer, either as an attachment or as a separate head. If you already have an electric shaver, this won’t set you back any money. You can also buy a separate beard trimmer, which ranges from moderately-priced to expensive, depending on how many features you are getting. If you are still feeling overwhelmed by all the shaving options, why not ask the one person who really knows this stuff — your barber. You can get the low-down on electric versus cartridge razors, and even get an extremely close shave with a straight blade while you’re there.